On Saturday, March 10th, members of our parish made a pilgrimage to San Francisco to visit some of the sites associated with our holy father and wonderworker St John of Shanghai and San Francisco. Our first stop was at the Old Cathedral 'Joy of All Who Sorrow' on Fulton St. This was the site where St John served for most of his tenure in San Francisco, while the new Cathedral on Geary Blvd. was being built. 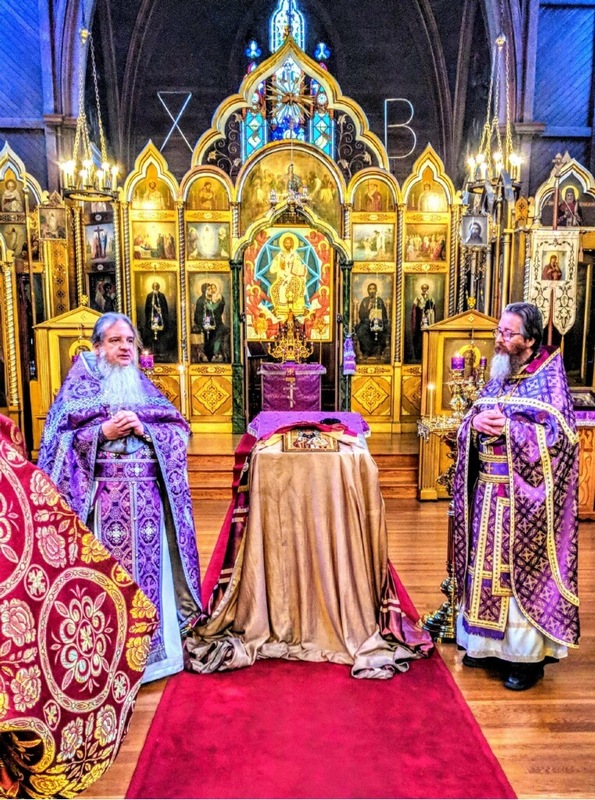 We began our day with the Divine Liturgy, followed by a Litia for the reposed, and then a Moleben to St John - afterwhich each person was able to come forward to be wrapped in the mantia (bishop's robe) of St John. Our host, Abbot James (Corazza), was most gracious and shared many edifying stories from the life of St John. After our prayers at the Old Cathedral, we enjoyed a festive lunch of Lenten Chinese food, courtesy of Max and Chrissy Neilepko. After lunch, we then went to St Tikhon's House where St John lived, had his orphanage, and where there is a small church which contains the iconostas from China and many precious icons which found their way out of Russia via China and the Phillipines. Pilgrims were treated to additional stories from the life of St John and were able to visit his cell and sit in his chair. Following this, many continued on to the New Cathedral on Geary Blvd. where we were able to venerate the incorrupt relics of the saint and address our prayers to him most directly there in his presence. It was truly a grace-filled day and we hope to be able to make this an annual event. Highlights, including some video, can be viewed here.